Search in sedimentary rocks younger than 541 Ma and ultimately you will find fossils. With a keen eye, considerable patience and luck you will be overwhelmed by their number and diversity. In rocks older than that you will be lucky to find the most meagre trace of a long-dead organism. The inconsistency of fossil preservation and evolution’s production of durable organic remains only late in its history conspire to make analysing tangible evidence for life’s course highly uncertain. For the Phanerozoic Eon, despite its signifying ‘abundant life’, we can never be sure how many living things existed at any one time, nor how diverse that life really was, although enough preserved material makes possible educated guesses at the latter. For earlier times eyeballs-out geology gives barely a hint of either, although there is sufficient in the way of carbon-bearing sediment to whet the imagination. Chapter 3 showed just how important life on this planet has been for the development of its surface conditions, unique in the Solar System. Since we and our global environment represent the latest stage in that co-evolution, trying to reconstruct its full course is as important as seeking our own geographic roots and family history on the vanishingly tiny scale of human events. Much detail and many surprises come from a purely biological study of ancient remains and even the genetic material of modern organisms, but here I want to introduce the gross course of events in the whole system of the outer Earth; the broadest context for our origins. Doing that centres on how the atmosphere has changed over geological time. An extremely abstract approach, you might think, and as we seek out evidence it might seem to become even more obscure. It shouldn’t, for the simple reason that life on Earth at its material base has always boiled down to the interlinking of two simple compounds – carbon dioxide and water – through the intermediary of the general building blocks of living cells – carbohydrates such as sugars (Chapter 3). As you will see in Part IV many different ways of life’s self-assembly and decay still live on in the three fundamental divisions of modern life, the archaea, bacteria and eukarya. The emergence of one special metabolism – photosynthesis – that uses the Sun’s light as an energy source brought in a third compound with which the vast bulk of life today is intimately bound. Photosynthetic autotrophs generate carbohydrates with molecular oxygen as a byproduct. We depend on an atmosphere in which that byproduct has become 21% of the volume of air. We and most animals suffocate when the oxygen level drops below about 10%, yet oxygen is one of the most reactive and dangerous common substances in the environment. Uncombined as the O2 molecule, but with an additional electron, oxygen is deeply implicated in damaging all kinds of cell – one of the notorious ‘free radicals’. In our metabolism we have to be protected from oxygen’s powerful reactivity by its transport, not as dissolved gas, but safely bound in the iron-rich molecule haemoglobin that colours red blood cells. Oxygen reacts with many elements and compounds, because its atomic structure has a thirst for electrons. Its name is assigned to one side of the general transfer of electrons from donors to acceptors that underpins all chemical reactions – oxidation or the transfer of electrons away from an atom, ion or compound. Its counterpart, the gain of electrons by atoms, ions or compounds, is called reduction. Note that a useful acronym for the difference is OILRIG; as regards electrons, oxidation is loss, reduction is gain. Both can be expressed in terms of two other very common components of chemical reactions; movement of a hydrogen ion (a hydrogen atom stripped of its single electron, and signified as H+). Oxidation can also involve the removal of hydrogen ions, and reduction is again the opposite; production of H+; oxidation is also gain of oxygen, whereas reduction is its loss You will find in Part IV that moving hydrogen ions and electrons forms the basis for the chemistry of living cells. So it is no real surprise that the powerful and most common oxidizing agent, oxygen, at some stage became interwoven with that chemistry. That it did not intervene from the start of life is due to its very reactivity. Except in stars and interstellar dust clouds oxygen is very rare in its uncombined form. All of it in planets is either in mineral molecules, such as SiO2 or quartz, or bonded with hydrogen in water; that is, if they are lifeless. Its presence as a free element is so unlikely outside of some kind of photosynthesis that oxygen’s easily detected abundance in the Earth’s atmosphere is a focus for astronomers seeking life elsewhere in the cosmos. If there be oxygen, there be photosynthetic life, or some inorganic chemistry that is extremely odd indeed. That does not demand that all life involves the release of oxygen, but such is the cosmic abundance of oxygen (the third most common element in the universe, after hydrogen and helium) that its eventual involvement as life evolves is inevitable. ‘Water is a civilised society’s second provision after law’ (an ancient Sumerian saying) , which says something interesting about the priorities of what is deemed civilised behaviour. As far as our planet goes, there has never been a shortage, for it belches from volcanoes continually. Only a small proportion becomes recycled back to the mantle in the long run. Much water locked in the oceanic crust going down subduction zones escapes the grip of the minerals in which it is bound because of heat and pressure, to emerge from the volcanoes above. So water has been destined to accumulate in the outer Earth since the planet stabilised. The Earth’s gravitational field is so strong that even hot, vigorously vibrating water molecules cannot escape its grip under normal circumstances. Ultra-violet light breaks a tiny amount into its component hydrogen and oxygen, when light hydrogen can reach escape velocity and be lost. The existence of oceans seems to bear witness to the overwhelming preponderance of mantle supply to loss by this means from the Earth. Mars shows signs of once having liquid water at the surface, but its lower gravity and sluggish volcanic activity means that such photodissociation has slowly stripped it to its present dryness. Water vapour is a ‘greenhouse’ gas, in the mantle it encourages vigour by reducing the temperature at which rock begins to melt, and it is essential to life. However, its abundance, together with the fact that it happily exists as gas, liquid and solid and quickly transforms from one to another under Earthly conditions mean that its history is one of omnipresence and variability in the short term. In this book its main significance is in the level to which oceans have risen and fallen, and the extent to which it has become temporarily locked as ice above sea level. These are important, but secondary matters. Although climate is hugely complicated, involving astronomical forces, the disposition of land and ocean, and the circulation of energy by winds and currents, its general state as reflected by surface temperature is governed by the atmosphere’s temporary retention of thermal radiation. That is the ‘greenhouse’ effect (Chapter 1), which keeps surface temperature above the -15°C average that would prevail if there was no atmospheric heat trapping. The central player in this retention is carbon dioxide. Reducing the evolution of the Earth system, life and all, to its bare bones requires us to examine the variation over time of the atmosphere’s content of CO2 and oxygen. Doing that is no easy matter, because nothing conveniently locks away samples of the atmosphere, except for the bubbles that glacial ice encloses, but that is ephemeral stuff. The clues have to come from sedimentary rocks and what lies within them. Chapter 7 made plain that the adage ‘the present is the key to the past’ works nowhere so well as in the sedimentary record. We can chart a multitude of details about past environments from this uniformitarian principle. As well as making sense of ancient climatic zonation from sensitive indicators plotted on palaeomagnetically reconstructed continents, such methods in the hands of experts show where and when deep-ocean and continental environments are preserved, and so on. Yet that fascinating information says little about atmospheric composition. That demands a focus on rocks that demonstrate chemical processes in which the atmosphere is deeply implicated. Those that involve its CO2 content are plentiful, being limestones of various kinds. For oxygen, matters are not so straightforward, and we must turn to whatever likely evidence presents itself, some of a truly bizarre nature. The best way to proceed is from the familiar to the increasingly strange, that is, by a backward look in time. The basic architecture of all today’s life on continents and in the seas turns up and is easily recognised in the Cenozoic era of ‘modern life’. Most useful are fossils of mammals, very different from modern ones, but nonetheless divisible from the start of the Cenozoic into the placental, marsupial and monotreme types (us, wombats and platypuses), and all dependent on a high atmospheric oxygen content. On their presence alone, it is safe to say that at the outset 65 Ma ago, the atmosphere was not a great deal different from the modern one. But there are suggestions that there may have been more oxygen early on. Those parts of the continents that were tropical at that time all possess a mantle of ancient blood-red soils, like those of northern Ethiopia and Eritrea (Introduction). These universal tropical laterites contain vast amounts of iron in the form of ferric oxide (Fe2O3). They are highly oxidised soils that lock up a great deal of oxygen. Similar ones form today, but by no means everywhere in the tropics. Up to about 35 Ma ago higher oxygen levels than now might have encouraged this intense oxidation. At the very base of the Cenozoic there is barely contestable evidence that the Earth had an atmosphere little different from that inside an intensive-care unit’s survival tents. Wherever it is found in sedimentary strata, the Mesozoic-Cenozoic boundary has a unique, thin layer. It contains all manner of oddities, of which more in Part VI. One of the strangest features is that it is full of soot particles preserved in both marine or terrestrial sediments. Soot implies fires, and soot everywhere suggests a global firestorm. Forest fires spring up now when drought makes woodland tinder dry. For the first two decades of the 21st century huge fires have raged each year somewhere, partly from drought, partly from the outcome of deforestation. Choking sooty smoke sometimes wreathes the whole of south-east Asia, adding to the pollution generated by its rapidly industrializing economies. But these are dry trees that burn. Global conflagration demands that green vegetation burns too, and that is rare today. Calculations from the concentration of this end-Mesozoic soot suggest that much of the terrestrial biomass burned down. While there are good reasons to indicate how such a global barbecue was triggered – probably from an impact by a large extraterrestrial object – that it raged through all biomass can have but one explanation. There must have been more oxygen in the air. The probability that green trees of the modern variety ignite in a fire increases from 1 in 10 for modern oxygen levels to 99 in 100 certainty with a level of 24%. Apart from signifying a catastrophe in which more oxygen-rich air is implicated, these figures suggest an upper limit on the amount of oxygen there can be in the air. Above 35% trees would burn spontaneously all the time, thereby keeping down the oxygen level to which they themselves contribute. The immediately preceding period to these lugubrious events is called the Cretaceous; it takes its name from a corruption of the German word kret meaning chalk. The white cliffs of the coasts of south-east Britain and northern France are so dramatic because they are composed of Cretaceous Chalk, and that thick unit extends buried as far as the Urals. Chalk is a very fine-grained limestone made of shelly remains of tiny algae. It is, however, but a small part of the products of vast, living carbonate ‘factories’ in both shallow and deep water that encircled the Cretaceous tropics to form the greatest concentration of limestones known from the geological record. The only conceivable source for all the CO2 buried in this carbonate form is the Cretaceous atmosphere. Such high limestone productivity is a clear sign that considerably more of the main ‘greenhouse’ gas resided in the Cretaceous atmosphere than now. Since large amounts entered long-term storage, for it to be maintained implies a far larger supply from volcanic action then. Yet the complexity of the balance means that it is difficult to judge directly what the atmospheric levels were. The earlier record of the Mesozoic contains plenty of limestone, but in its very oldest parts and the immediately underlying, and therefore youngest Palaeozoic strata, there is another major atmospheric indicator. Wind-blown sands, and lake beds form distinctive brilliant red outcrops, formed in the dry heart of Pangaea. They are much different from the early Cenozoic laterite soils. For one thing they are much thicker, for another they are not soils formed by slow weathering but accumulations of eroded material. They are red because each sand or silt grain is wrapped in a thin coat of ferric oxide. Even more so than the younger laterite blanket, these Permian and early Triassic redbeds (Chapter 7) lock away massive amounts of oxygen. Here again is evidence for an unusually high oxygen level in the atmosphere that influenced continental chemistry (incidentally, the ‘Red Centre’ of Australia, and red dunes of parts of other modern deserts probably inherit their colour from the early-Cenozoic laterites). That this period and the one immediately preceding it had oxygen-rich air is confirmed from an unusual source. Among the most strange features of the fossil record in the Carboniferous Period is the abundance of insects. Their diversity took a sudden leap about 320 Ma ago. They became very large and they soon adopted flying. One dragonfly had a wingspan of 70 cm and, with a body 3 cm thick, dwarfed any modern descendants. The Carboniferous was a world of monster bugs, but they cannot reach such dimensions now. Insects do not have lungs, but respire passively by diffusion of air through their body-walls. They do not breathe, so diffusion and atmospheric oxygen levels govern their maximum size, especially for those that metabolise rapidly in order to fly. Giant flying insects point to higher oxygen levels in the period when most hard-coal reserves were deposited. To become successful fliers at the same time perhaps implies a denser atmosphere too. What encouraged insects’ forbears to colonise the land, as too the first land vertebrates, was the earlier invasion by plant life; a new food supply on the fringes of the oceans. The evolution of early land plants to tree-sized forms fed partially rotted debris to the subsiding swamplands in which coal accumulated. Such burial must have drawn down CO2 to leave a photosynthetic excess of oxygen, but that is a topic for Parts V and VI. The venture of vertebrates from sea to land was a big step. From the use of gills for intake of oxygen and exhalation of CO2 waste gas, to the evolution of lungs, as well as modifications in reproduction so that eggs could survive out of water, demanded substantial changes in architecture. Some scientists argue that only a boost in oxygen levels made both possible. Reptile eggs laid in the air are interesting. Coated in a hard shell to prevent drying, they must pass oxygen through pores to supply the developing embryo. The amphibian to reptile transition took place late in the Carboniferous to Permian highly oxygenated world. Before the colonisation of land there are no such handy clues to the oxygen content of the atmosphere. For the earlier Earth it is a matter of trying to glean whatever oxygen-related signs happen to present themselves. The redbeds laid down on land show that air of their time had enough potential to mop up electrons from the outer shells of iron atoms to stabilise them as ferric (Fe3+) ions, and contained enough oxygen to lock them in red ferric oxide and hydroxide. Because such ferric iron minerals are among the most insoluble common compounds in rocks, once formed they tend to remain as bright signatures that the atmosphere was oxidizing and contained oxygen. In rock sequences older than about 2.2 Ga, continental redbeds are seen nowhere. That time marks the point at which the atmosphere attained sufficient oxygen for oxidation to perform this useful trick. However, that particular oxygen level is difficult to estimate. The chemistry of atmosphere-water-rock being a great deal more complicated than just a relationship between oxygen and iron in the proverbial test tube, we need a more penetrating view. Iron first enters the regime of surface processes locked in crystals within igneous rocks, mainly as silicates plus some sulfides. To become mobile and so available for redistribution by water into newly deposited sediments, the iron-rich igneous minerals must be rotted, and the main agency for this comprises the H+ ions released by the weak carbonic acid in rainwater. To cut a long story short, that igneous iron is mainly in its ferrous (Fe2+) form, with one more electron in its outer shell than ferric iron. Water can dissolve and move ferrous iron, provided that extra electron is not snatched up by oxygen. So the level of CO2 in the atmosphere has an important control over how much iron might be released by weathering. The relative proportions of CO2 and oxygen therefore control the ability of redbeds to form on the land surface. Experiments suggest that for redbeds not to form oxygen must have been at around the same concentration as CO2 or lower. Today oxygen is 600 times more abundant than carbon dioxide. We cannot infer from redbed evidence alone that there was very little oxygen 2.2 Ga ago, nor that there was a great deal more CO2; just that the two gases were in very different proportions compared with today’s air. There are two other indicators of an important change in the state of the atmosphere at that time. In the presence of oxygen, igneous iron sulfide quickly reacts to form sulfuric acid and a ferric hydroxide slime or ochre. In rocks older than 2.2 Ga, some sediments contain rounded grains of these sulfides that have been transported unchanged by water. At much the same threshold of oxidation potential uranium switches from being insoluble to highly soluble. The older sediments with sulfide grains sometimes contain rounded grains of uranium minerals, which would have broken down rapidly under later continental conditions. The only way out of the bind regarding an estimate for the actual concentrations of both interrelated gases is an independent assessment of one or the other. The only handy guide is to the level of CO2 in aerated soils. Under conditions sufficiently reducing for iron dissolved in water to be moved in soil, it may precipitate as some ferrous iron compound. There are three choices; as a carbonate, as a silicate or not at all. In the last case it stays dissolved, eventually to reach rivers and ultimately the ocean. Examining the few fossil soils older than 2.2 Ga reveals that none of them contain iron carbonate, but iron silicates had been precipitated in some of them while they formed. Geochemical experiments show that iron carbonate would form in soil only if CO2 was at least 0.4% by volume of the air contained in soils, which is 100 times more abundant than it is at present. The two lines of evidence suggest that before 2.2 Ga oxygen amounted to less than 0.4% of the air and CO2 must have been more abundant than that. An abundance of CO2 before 2.2 Ga goes some way to account for an enhanced ‘greenhouse’ effect in the early atmosphere needed to stop the Earth from freezing over when the Sun was less radiant (Part III). Carbon dioxide is a likely candidate for the early Earth’s ‘rescue’ from becoming locked into a perpetually icebound condition, while nowadays that emitted by human actions may drive it in the opposite direction. This limited evidence for a ‘Great Oxidation Event’ at around 2.2 Ga is supported by other more intricate geochemical arguments. But a few geochemists have refuted that hypothesis by citing nuances within the available data; a good illustration of the flux of ideas when information is in short supply. Later in geological history, more data on the relative abundances of the crucial gases O2­ and CO2 shows up, even to the extent of suggesting actual concentrations in the atmosphere. The data are often abstruse, but one source of information that applies to CO2 after the land became vegetated is easier to understand. Plants need to take in carbon dioxide through their leaves in order to photosynthesise, and that is via pores or stomata in the outermost cells. The number of leaf stomata per square centimetre is a measure of atmospheric concentration of CO2 – the more of that gas is available, the less densely packed are these pores. Figure 8.1 shows how estimates of atmospheric composition have changed through time. 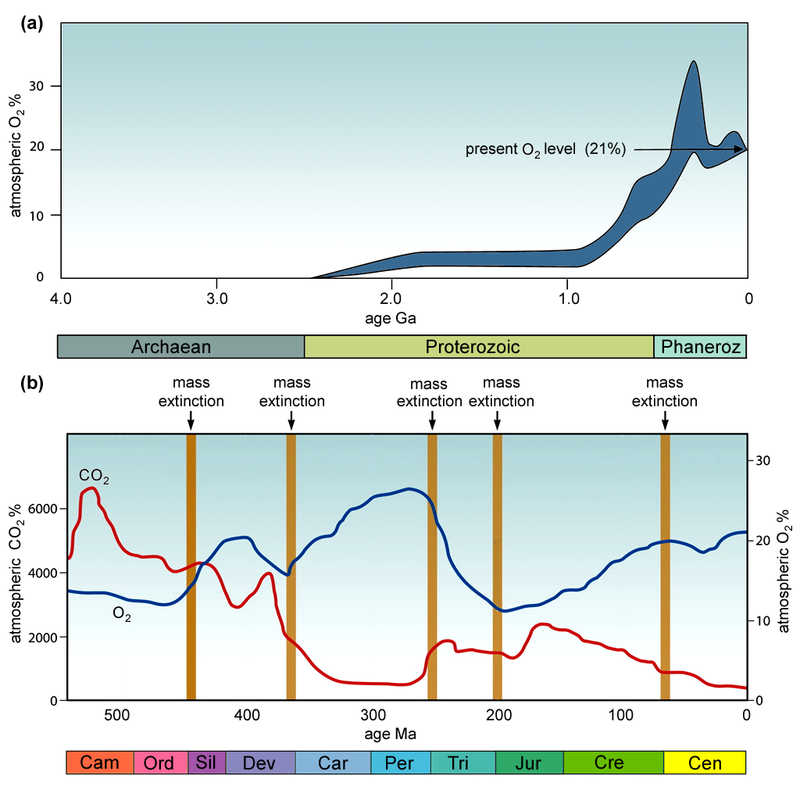 Figure 8.1 (a) Variation of atmospheric oxygen through geological time; (b) Atmospheric oxygen (blue) and carbon dioxide (red) values for the Phanerozoic Eon. Precambrian CO2 data are patchy and disputed, so are not shown . By far the world’s largest repositories of iron ore are the banded iron formations or BIFs of the older Precambrian. They are made mainly of ferric oxide, and that presents an enigma, as you saw in Chapter 7. Before 2.2 Ga, the air and the continental surface experienced conditions that permitted ferrous iron to remain dissolved. Continental redbeds did not form, yet ferric oxides precipitated in marine environments over great lengths of time. They do represent oxidizing conditions and both iron and oxygen being available in large amounts in sea water. However, the minute layers in BIFs show continuous transport of dissolved iron into the BIF basins, subject to intricate controls that may be partly tidal, partly seasonal and perhaps even varying with the Milankovic astronomical cycles of changing solar energy supply. As regards the chemistry at work, we can visualise a simple scenario. If oxygen in seawater then was available only in the vicinity of the BIF basins, everywhere else iron would exist in its reduced, soluble, ferrous form. Where the one met the other, oxidation would ensure rapid precipitation of ferric oxide. For such vast repositories of iron-rich sediment to build up day by day demands that both ferrous iron and oxygen were in continual supply, for if either one ran out the reaction would stop and other kinds of sediment would accumulate. Even if oxygen was abundant in the early Precambrian atmosphere, it is inconceivable that it would enter sea water only in specific locations. In any case oxygen only constituted a tiny proportion of the air, if there was any at all. As far as we know for such a world, the only source of abundant oxygen in the oceans would have to be some kind of photosynthesis; a living process is implicated in formation of the ores for industry’s most used metal. The ultimate source of iron is the Earth’s mantle, from which partial melting draws it off in the form of various kinds of basaltic magma. The bulk of this magma emerges today as part of plate tectonics to form oceanic crust, and more occasionally as flood basalts associated with rising plumes from the deep mantle. Whatever their origins, oceanic magmas crystallise to form silicate minerals that contain iron in their structure. The associated heat warms seawater that has seeped into the lithosphere, causing igneous minerals to rot, dissolving parts of them, including iron, and circulating these hydrothermal fluids in the lithosphere. Such fluids must eventually well out. Today they source the ‘black smokers’ discovered in association with mid-ocean rift systems. The ‘smoke’ consists of fine insoluble compounds precipitated by reaction between the emerging fluids and modern seawater. That is oxygenated, and all the iron falls out either as ferric oxides and hydroxides, or as sulfides that combine iron with sulfur. On the pre-2.2 Ga world, such precipitation reactions would consume any oxygen dissolved in deep ocean water, leaving an excess of dissolved, originally magmatic ferrous iron in solution. Heated by hydrothermal activity iron-rich deep water would rise and mix with the rest of the water column, making seawater steadily more iron rich. However, should this circulation meet patches of water oxygenated by photosynthetic organisms, oxidation would instantly precipitate the dissolved iron there and nowhere else. That seems to be a plausible explanation for the massive BIFs of early Precambrian times. Mapping out their distribution in each of the world’s great iron-ore provinces shows that BIFs do give way laterally to other submarine sediments. In almost all cases, among these other sediments are limestones with a distinctive structure. They contain layer after layer arranged in strange, bulbous structures. These are stromatolites, in which microscopic examination occasionally reveals filamentous mats separating the layers. They are biologically precipitated limestones, albeit devoid of tangible fossils. Part IV takes up the question of the organisms responsible. The association of BIFs and stromatolitic limestones suggests that the latter were the required photosynthetic sources of the oxygen in BIFs. Oxygen is potentially a threat to all life, particularly to single-celled prokaryotes. Produced by life itself, only the vigorous intervention of the mantle’s iron release mopped it up before its toxic effects polluted the world, or life itself evolved a means of both tolerating and using it. However persuasive this account of BIF formation might seem, it is not the only one. Some types of modern bacteria, including photosynthesisers that do not produce oxygen, are able to fix iron as Fe-3 hydroxides where there is very little oxygen or none at all. Given sufficient nutrients, such bacteria are able to deposit ferric iron at rates that match those needed to build up great thicknesses of BIFs; about 100 m per million years. That would need 1022 individual cells infesting each BIF basin. What seems to be an unimaginable number of bacteria amounts to only about 40 thousand cells per cubic centimetre of the seawater, which is actually far fewer bacterial cells than the number that build plaque on our teeth! Also, in the geosciences it is never wise to demand that there was ‘nothing’ of some material at such and such a time. In the case of atmospheric oxygen, recent studies of the isotopes of chromium in an Archaean palaeosol and a BIF the lies on top of it suggest that about 3 Ga ago the atmosphere did contain oxygen at between 6 x 10­-5 to 3 x 10-3 the atmospheric level at present; not much but enough to be detected by a technical break-through. One explanation is that oxygen-producing photosynthesisers even that far back had colonised the land. The inescapability of CO2 having been an increasingly dominant atmospheric gas the further back in time we venture, that its presence was the only escape mechanism from a permanently frozen early world, and the fact that it is the prime building block for life emhasise the supreme interconnection of life, atmosphere, oceans, sedimentation and climate. The record of oxygen, a waste product of now dominant photosynthetic life takes this web of checks and balances deeper still. For the early part of Earth history, it is tied to the mantle through its literal connection with iron. There have been hints in this chapter too that iron is not a mere bit player that serves merely as a buffer for oxygen. Through the grand unification it is also central to living processes at the core of the eye-wateringly named enzyme ribulose-1,5-bisphosphate carboxylase/oxygenase, or RuBisCO for short. RuBisCO is involved in the first major step of carbon fixation by photosynthesis into energy-rich bio-molecules such as sugars. Today it is probably the most abundant enzyme on the planet of the living, and you will meet it again. We leave with a question implied by this chapter’s opening paragraph, ‘How much life has there been?’ There is a way to look at its relative abundance through time, if not to answer the question fully. Sedimentation always has a chance to bury some organic tissue, if it is rapid enough to interrupt the carbohydrate to water plus carbon dioxide direction of life’s central chemical equilibrium. Although the molecules change through heating, some trace of them remains, provided erosion does not remove those sediments. Simplifying all the starting materials and the various stages of their degradation to the organic carbon content in sedimentary rock throws up a surprise. Over the 542 Ma long Phanerozoic Eon, the average carbon content of sedimentary rocks has averaged 0.5%. At Isua in West Greenland (Chapter 5) the earliest of all recogniseable sediments, close to four billion years in age, contain about 0.6%. Did life arise at about that time, had it been around for some time beforehand or can sedimentary carbon on its own give a false signal? Whatever, once life did emerge on our home world it radically transformed it, again and again.